From Saturday 15th June I officially started my Fasting and OMAD (One Meal A Day)Journey. Saturday and Sunday were easy as I was getting back to eat once a day and on top of that I was eating earlier, around 7pm with the family instead of 9.20pm during Ramadan. I have to make an important distinction, fasting to Me means no drinks from 2am till sunset, and no food from 10.30pm till 9.30pm the following evening. My idea is to fast once/twice a week and follow the OMAD 5 times/week ( this means I will have one meal a day 7 days per week) till the end of August and see what I achieve! Monday 18th, Fasting day (no liquid): The unknown! I was Fasting and felt No hunger or thirst at all. The Energy levels were steady, i had a good weight session in the morning. Throughout the day I felt slow and intrigued as I had to go to the BJJ academy for the first time in a month and a half. I went to the BJJ Aacademy and it actually went well, I sparred 5 rounds of 6 minutes and didn't feel tired or lacking energy. Food:The meal in the evening frustrated me, I normally eat a big plate followed by a big salad and then a banana, a peanut butter sandwich, some dark and milk chocolate, all wash away with a large milk coffee. Yesterday for the first time I felt FULL after the salad...I MAY HAVE TO EAT LESS! Tuesday 19th, Fasting day (no liquid): The Positive Outcome. I slept 4 hours so I am really tired today. Hunger: I didn't feel hungry or thirsty at all. My energy and mood:They were both altered by my fatigue, it improved during the day and ironically I was at my best during the spin class at 6pm. The spin class and how I was going to perform was the big question mark. The response couldn't be more positive, I had a strong class, I worked hard and everything without drinking at all during the day. Both Monday and Tuesday feel like victory as I had to perform in my most demanding activities late in the day and I managed to dig dip in me and make things happen. Also I didn't drink any liquid at all which make the outcome more satisfying. I am pleased. Wednesday 20th, OMAD: Easy With Liquid! Hunger: None, I am actually feeling the need to eat less in the evening... a bit ANNOYING.Thirst: not an issue as I can drink and I have been drinking a lot if water, surprisingly as I don't like water! I am having a coffee and just the thought makes me HAPPY!Mood: way better because I can drink, it feels easy and also I slept MORE as I had an early cancelation. It TURNS OUT THAT MY MAIN PROBLEM IS LACK OF SLEEP AND ALL THE SYMPTOMS DERIVED FROM IT. It was a very easy day, I didn't feel hungry BUT I felt like eating as I had no obligation. When I Fast and don't drink at the same time, I am more focused. When I don't eat but can drink, it feels boringly EASY! Another annoying thing, I will start cutting on food. My stomach is definitely shrinking!! Thursday 21st, OMAD: I felt Great! Hunger: Surprise surprise, I did feel hungry today, slightly but I did. It turns out that being able to drink make the fast easier, but drinking makes me crave for food. Today I trained 3 times 5.45-6.30am weight, 9-10am BJJ and 6-6.45pm Spin, I came home HUNGRY AND I KILLED IT. The menu was spaghetti bolognese, I ate a lot of pasta, a plate of kale with sardine and today I had 3 slices of bread with butter and peanut butter, 1 banana and some dark chocolate and my coffee with milk. I FEEL EPIC AND I COULD EAT MORE. GUYS I FAST BECAUSE I WANT TO, SO I AM NOT PLANNING ON BEING MISERABLEWHEN I EAT, I EAT WHAT I WANT! Thirst: I wasn't thirsty as I had half a cup of water followed by a black coffee at 5.30am, then a bone broth at 12.30pm, another coffee at 4.30pm and finally half a liter of water with sea salt from 6-6.45pm during the spin class. I drank Sea Salt water as I discovered today that I was exhibiting signs of lacking magnesium, moody, muscle tightness, near cramps. To my surprise it worked fine and as I am writing now 21.41pm, I don't feel tightness in my legs! It is improving but the truth is that I am in difficult time of the year, as I go to bed around 11pm due to my last prayer and I get up around 2am for the first one and return to bed for couple of hours before getting at 4.20 or 5am depending on the day. I suffer of a serious lack of sleep during the week, I manage to catch up in weekends. My mood is highly influenced by the fatigue I feel. I liked the day, I learnt few things that I will apply tomorrow. 1. Not to rely on coffee, 2 max during the day. 2. Drink water with Sea salt to add and keep minerals and avoid cramping. I implemented some changes in my morning routine and it made the difference. 1. I drank apple cider vinegar first thing in the morning. 2. I started to sip a black coffee during the spin class then once I finished the coffee, I hydrated myself with water with sea salt. It is 8.30am and I have to admit that I really felt good, super energized, at the top of my game. 9am at home, everything started to go downhill, I started to feel slow tired, sluggish. It is 6.02pm and I decided to eat as I feel properly MISERABLE! (Should eat around 8pm, so it is not dramatic as I still fasted for 22 hours!). I started feeding with 3 tea spoon of peanut butter, I went for high fat food as fat restricts or annihilates hunger. After 10 minutes I felt better but I made the math, we have people coming over to eat at 8pm and we are getting a take away. So I decided to eat 200g of kale with a tin of sardine and change my take away order. 8pm the order is in, they delivered two extra portions of baked potatoes...I have one with the squids I ordered and topped the meal up with a massive homemade bowls of 2 gems salad, a yellow pepper with 4 cherry tomatoes, chia seed" and finally I had a large milk coffee and some dark chocolate. after my feast, I can feel my blood sugar has finally stabilize, I felt normal again. I almost forgot, I started to take vitamins B and Magnesium supplement. 11pm marks the end of that CRAZIEST DAY I recall. I am left with some questions to answer, what has happened to me? I will try to figure out on Saturday and keep you updated. Saturday 23rd June, The Revelation! I had a decent night sleep 5-5h30 sleep, I am stressed out as I don't know what exactly happened yesterday. 6am, I had a black coffee, I feel full and energized from the food of yesterday. 7am the workout I've done consisted of overhead lunges, good morning and deadlift. I feel alright but am decided to take it easy during the spin class. Yesterday I worked REALLY HARD DURING THE SPIN CLASS AND I AM NORMALLY BAD ON FRIDAY MORNING AS TRAINING BJJ AND SPIN BACK TO BACK ALWAYS HURT ME. I REALLY BELIEVED THAT I SUFFER WHEN I DO CARDIO. ANOTHER IMPORTANT FACTOR HAS TO BE TAKEN INTO ACCOUNT...THE LACK OF SLEEP. I DONT SLEEP ENOUGH, IT IS A FACT, I NEED TO ADDRESS IT AS IT DOES REALLY MAKE MY LIFE HARDER. It is 4.35pm and I am adamant, my crash from yesterday was due to overdoing it, I simply pushed too hard during the spin class and gradually became hypoglycemic. I Simply swallowed More than I could CHEW! So my day so far, I was training weight from 6.10-7am, then spin from 9-10am. I must admit that I was apprehensive BUT I controlled my effort during the spin class and it went well. During the rest of the day my energy level has been steady. On top of that I managed to have one hour nap so I really feel good. In general the day was good, my energy level were steady, I didn't feel fatigued, just relaxed. i felt no hunger so ever or thrust. I felt in control. My wife Cooked ameal that I really like, so I went for it and ate a lot. I can say that today WAS A GOOD DAY! Sunday 24th June: The Confirmation! Today, I put all my theories to the test, I started with a coffee and my first training session 6.40-7.30am and the Spin class 9.30-10.30am. Both session went well, I generally don't have problems with weight training but suffer with Cardio. I had in the back of my head what happened on Friday so I made sure to be in control and it worked! During and after the spin class I felt my blood sugar leveled, I felt normal/good. Today was really hot so I blended in the day, walking slow as I normally do and doing as little I can. This is just the way I am, work/Train Really Hard and then switch off and move as fast as a Sloth! 1. As I advanced in the week, I had more rest/sleep. YOU NEED YOUR REST! 2. During the week I assessed situations then tested them the following day and drew new conclusions. 3. I realized the importance of NOT OVERDOING IT AND LISTENING TO MY BODY! 4. I started to use B vitamins to ensure that my energy levels are optimum and Magnesium for the mood, as well as the stiffness and cramps. 5. I implemented a drinking routine, water first thing in the morning on FASTING/OMAD days. On OMAD days, I will have more water before my pre workout black coffee. After the workout I will sip 1/2 liter of water with Sea Salt. Then I will have antithetical coffee during the day, then nothing till I Eat. So far this seems to be the wining formula, nevertheless I am reading and open to new experiments. Tuesday 19th of June 5am, I slept close to 4 hours, I am knackerd and weigh in 83.5kg, beginning of the Journey! Part 1: Ramadan, OMAD (one meal a day), 2 meals a day, intermittent fasting! Ramadan is over and it has been the "Easiest" one I experienced in my short Muslim life. I converted to Islam few days before getting married in July 2012. Why was it the easiest? In 6 years as a Muslim, I got into the habit of fasting the whole year long once to twice a week, so I got kind of used to be without food and drink. On top of that, the previous Ramadan were longer, later in the year (mid summer). I normally assess everything I do related to nutrition, then I compare and keep what works and discard what does not. This led me to adopt a 23 hours fasting Window and 1 hour to eat and drink, I would also drink water around 2am, right before my early morning prayer. In a spiritual perspective, it is my best Ramadan up to date, as I was going to the mosque late (11pm/midnight) 3 evening per week times and I got up each and every day around 2am to pray. 1. I felt good: I generally feel good when I fast, I don't feel hunger or thirst. I am just in that "diesel" mode where I can do everything but I make sure not to overdo it! A good definition of my state would be, "I cruise". 2. My energy levels are steady, during Ramadan I lifted weight Tuesday,Thursday, Saturday and Sunday doing heavy leg sessions as the one in bracket (21,18,15,12,9,6,1 reps of back squat @80,90,100,110,115,120,125kg or 10 sets 10 reps of back squat @100kg). Trained BJJ 1h30 on Tuesday, Wednesday, Thursday and fridays and did a 45 minutes spin class on Tuesday. I did not lose strength, the contrary, I gained some, The weight I lifted went up, I bettered the times in the timed exercises. But Truth been told I didn't feel great! I almost forgot to say, I was bipolar! Moody with my wife (I apologised and made peace with her) and my boys and in contrast in a good mood with everybody else. As if I was a king an effort at work, in the mosque but not at home (shame on me). 3. On the 27th day of the Ramadan, Almost 4 weeks in, something happened! I remember it like if it was yesterday, on Monday the 11th of June my body clock finally adapted to my new eating schedule. I felt full of energy, dropped 1'10" on a workout I did the previous week and I feel energised the whole day and the following. It basically took me a month to get in Ketosis, my body switched its energy channel and I could live on my body fat storage and feel Great the whole day, I could work hard and be/feel positive. During the Ramadan, I read a lot about Nutrition, intermittent fasting in general and the OMAD (one meal a day) protocol in particular. It turns out that I am professional at fasting, as I do it often. I mixed my experience with knowledge and I came to the conclusion that I can guide You! So many people struggle with weight Loss, fat loss, not water loss! I Started the Ramadan/OMAD @86.8kg and finished 30 days later weighing 83.4kg! Guys you want to know more and wants real Results! Get in touch! 43>42 yo... Like a good wine I get better with the time! Guys I recently turned 44 and I looked back at my miserable 42 compared to my magnificent 43yo and I SHOUT, "don't give up on Yourself!!!" Your Life is and Will Be what you Want it to BE. My 42 was terrible, I had terrible back pain and other injuries, as an example I once lifted 130kg back squat (BS, my max is 150kg) and couldn't train my legs for 3 weeks. That year I went to BJJ European Championship and lost my first fight...A bad Year! But, I didn't give up on me. I refused to lose to what seemed to be my fate, I tried a lot, failed a lot and learn a lot. This morning I did 3 sets of 3 125kg BS, I won the BJJ EC. I now lift weight 4x a week train BJJ 5x, read like I never did. I FEEL LIKE BEAST, LIVE LIKE A BEAST BECAUSE I AM A BEAST! I totally believe in that concept and it does make sense to me. Anytime I had a Big Challenge ahead of Me and looked back at How/Why I overcame it, Luck seemed to have been BY MY SIDE. BUT I LOOKED CLOSER AND I REALISED THAT, SOMEHOW I FORCED MY OWN LUCK. Let Be Specific, I remember back in the days...in 2007 I had a my first Thai Boxing competitive fight and I was not going to leave the ring without Winning. I Was having a great fight, beating my opponent up in the first round And We get back to our corners at the end of the round. In the second round I came back with the same dynamic Till I prepared myself to throw a right hook and my opponent threw a left high kick...the rest comes from my imagination. This means that I was out cold, KO, I realised as I found myself on the floor watching the ring ropes upside down...My OPPONENT HAD A TAE KWENDO BACKGROUND AND WASNT LUCKY, HE SEIZED HIS OPPORTUNITY. Months later, I found myself irony of Life (God Plans) in the same situation but this time I was fighting to become Spanish Semi Pro Thai Boxing Champion. My opponent threw a High Kick and I slightly moved almost instinctively and it bounced on my right shoulder. I kept on fighting and eventually won the fight and become Spanish Champion. Luck? not really, most likely a repeat of past situation, in other words we generally somehow prepare ourselves for the possible opportunity to come. As I am a Positive and Proactive person, it is how I see the things. To me Luck is more a predisposition as I have somehow prepared myself to MAKE THING HAPPEN WHEN THE TIME ARISES. When I am With YOU, I AM STANDING IN AN ARMY... E, Goulding. No, no I am not a fan of E Goulding but I definitely agree with the title of that song. When I used to train on my own and compete for myself I was achieving stuffs. I was progressing slowly and winning a bit. The day I understood that I was part of the team, a clan, a crew an Army, things started to change drastically. I used to play football till my early twenties and I was often frustrated as I felt I was working harder than some of my teammates. I eventually quit playing and started Thai-Boxing, I thought that doing a Martial Art where you are totally accountable for your mistakes was the way to go. I was pretty good, I won after 7 months of practice with no previous background the Spanish Semi-Pro Thai-Boxing Championship. Thanks to my first sonorous LOSS BY KO and the reaction of my coach and my teammates, I REALISED THAT I WAS NEVER ALONE. Bernardo my coach, he was and is STILL LIKE A FATHER TO ME, HE TOLD ME: "When You Lost Part of Me Lost With You, I Felt Your Pain..."
Since that day I know that I NEVER WALKED ALONE. When I go to train even if I am on my Own, I Feel The Support, When I Compete I know I REPRESENT MY PEOPLE, MY FAMILY, MY CREW. Theses guys push me, make better, hungrier...I would definitely go to war with them! You Can Only Do So Much On Your Own, Surround Yourself With The Right People And YOU WILL NEVER WALK ALONE! Post Championship Syndrome... it is around 8.30pm Friday 19th of January in Lisbon Portugal. After a deserved and necessary shower, my brother and I set to the restaurant located in front of our hotel. International Cuisine...we chose an Angolan meal that consists of white rice, a peanut buttery sauce, chicken and kasav. To me it feels like extasy...imagine, it is the first meal in 2 weeks that I can enjoy without fear of PUTTING ON WEIGHT...I enjoy it. After the dinner we head back to the hotel to get to bed as soon as possible as we have to be up at 3.30am to catch a 6.15 for my brother and a 6.40am plane home. Guess what, I could not sleep the whole night, my hormones were playing up and despite being exhausted, I simply couldn't SLEEP. 3.30am Saturday 20th, the 3 alarms we had ready and the hotel phone rang... time to get ready for the departure. 4.15am we arrive at Lisbon airport and make some time, my eyes are wide open, so opened they hurt, I feel like a zombie, almost too tired to sleep. 5am they open the cafe and the shops, I promised myself not to leave Lisbon without having some pastry, so I order one and a hot chocolate...so good. After my early breakfast, I go and buy my wife her Portugal favorites, Ginghiña and Crema de Nata. The former is a Portuguese liquor and the latter a pastry, both are part of the deal that allow me to go away to compete for 3 days without my wife to complain... she knows I bring her some treats! The flight and the coach home went fine, I finally arrive home and am received with warm opened arms by my dear family, it really a good feeling! Monday is the weirdest day of all, it is my third day without exercising and it starts to do my head in. I manage to book at 5.30am a sport massage with Josh Crosley (I highly recommend), he sees me at 9.30am and Literally beat my body up. The massage is s deep that it took me a day and a half to recover and actually feel REALLY GOOD. 1.15pm, Now come the amazing, to be congratulated in the gym is to be expected, but while on my bike at the round about Of Chappelfield waiting to cross, to have a guy stopped his car and popped his head at the window and congratulate me, this felt special, this felt Really good. Monday 3pm, I am at school with waiting for my son Milo and to my surprise several parents of kids who are in the same class as my boy come to congratulate me. I start to feel AWKWARD, as I onliy meet them at the time of the school pick up. 3.05pm, my son school teacher has opened the classroom door and comes to me...she then says: massive congratulations for your big achievement. Your son MILO IS SO PROUD OF YOU, SINCE HE ARRIVED THIS MORNING HE HASNT STOPPED TALKING ABOUT YOU COMING HOME WITH A GOLD MEDAL." This was it, this did me, I was fighting not to cry on the spot. THIS TO ME IS THE MOST IMPORTANT THING, EVERYTHING I DO, I DO FOR ME, BUT SECOND COME MY SONS. I WANT TO BE AN EXAMPLE, TO INSPIRE THEM. I WANT THEM TO BE PROUD OF THEIR DAD. I WOULD NEVER IMAGINED IT WOULD HAPPEN SO EARLY, I WOULD NEVER HAVE IMAGINED THAT MY 5 YEARS BOY WOULD CONNECT WITH ME TO THE POINT TO KNOW HOW IMPORTANT THAT MEDAL IS TO ME. When I look back everything falls in its place, the year of pain, losses, the hours of training, the frustration...then the last minute doubts before the first fight, finally the LIBERATION. I got at my return to norwich to savor of "Fame", to be able "Eat" what I want and to "Rest". Guess what I have Enough of it, all this is NECESSARY AND GOOD BUT, WHAT I LIKE AND LOVE IS THE TOTAL OPPOSITE. I like to Grind at crazy times in the morning, I like to feel good, strong and fit and I feel like that when I EAT LESS CHOCOLATE AND MORE VEGETABLES, and above all I love to Train. All the things above are necessary but they are REWARDS. They are 20% of my habits, The other 80% makes who I AM. IT IS FAIR TO SAY THAT BEING GOOD 80% o the time allows me to Switch off 20% with no Guilt and FEEL GOOD! I want to be the Champion BUT KEEP The CHALLENGER LOW PROFILE. I HAVE TO STAY HUNGRY, KEEP ON WITH THE GRIND. THE IMPORTANT IS NOT THE DESTINATION (the medal), THE IMPORTANT IS THE JOURNEY (the training, the losses, the emotions, the people you meet). Guys, find a PASSION AND WORK HARD, IT WILL PAY OFF! YES I AM BJJ EUROPEAN CHAMPION AGAIN. For the 3rd time I won the BJJ European Championship, first time as a white belt, then blue, then bronze as a brown and NOW GOLD as a BROWN BELT. IT WAS MY HARDEST COMPETITION BY FAR! It has been a hard, tensed and painful journey to make it to the top of Europe. This journey started in November 2015 when I received my brown belt. It was an honor to become brown belt after only 5 years of BJJ practice. Nevertheless precocity comes with a price, lack of knowledge and experience. As a newly become brown belt I wanted and needed to work the extra hours to make up for my lack of knowledge and experience. THIS IS NOT THE WORST, the worst for me was that I had to LOSE IN ORDER TO GROW, TO LEARN. Why to LOSE? Very simple, if I kept doing BJJ the way I did till now my evolution would eventually have stopped. I needed to get out of my comfort zone and learn the basics, the fundamentals and add new skills. WHEN YOU GET OUT OF YOUR COMFORT ZONE, YOU FAIL AND A LOT. I HAVE LOST MORE FIGHTS IN 2 years as a brown belt than I did in my 5 previous years. I CAME THIS YEAR TO THE BJJ EUROPEAN CHAMPIONSHIP UNDER PRESSURE! My record previous to the competition was 5 losses as a brown belt for 2 victories and now I can SAY IT, only one guy was BETTER THAN ME. SO I WAS FRUSTRATED, REALLY FRUSTRATED! Today before the Competition I COULDNT SEE MYSELF LOOSING...IT WOULD HAVE SHATTERED MY SELF CONFIDENCE. I WORK HARD, I HAVE FAITH (I am Muslim) BUT I WORK HARD. I AM UP AT 4am MONDAY TO FRIDAY TO PRACTICE ON MY CRAFT. My BJJ is getting better and I still have a lot to work on, BUT MY CONDITIONING IS TOP. As a matter of fact I won the Championship because I was the FITTEST GUY OUT THERE. Apart from my first fight that I could have lost, as it was draw and a referee decision in my favor that sent me through the following round. The next 3 fights followed the same scenario, hard fights till we reached the 3 minutes cap, beyond the 3 minutes, I smashed all my opponents. I won the 1/4 final 7-0, the semi final 18-2 and the final 9-0, and to my delight I had to FIGHT REALLY HARD AS IN THESE THREE FIGHTS I escaped various submission attempts from my opponents. After winning the gold medal in my weight category (under 88.3kg) I decided to fight in Absolute. Absolute means all the athletes who made the podium in my age group category from 60kg to hundred plus kilos. GUYS MY MESSAGE TO YOU IS DREAM BIG, NEVER GIVE UP, NEVER GIVE IN. TO BE SUCCESFUL IS HARD, IT IS NOT A STRAIGHT PATH, THERE ARE FEW UPS AND MANY, MANY DOWNS. BELIEVE IN YOURSELF, SURROUND YOURSELF WITH THE RIGHT POSITIVE PEOPLE AND ABOVE ALL WORK HARD! Me with a gold Medal, courtesy of my son Milo. He drew this before the tournament I kept the drawing as my iPad wallpaper and could see it everyday and make sure I keep my promise if bringing the gold home. Guys, success is something totally personal, You are successful when you reach a goal you set. By setting a goal and achieving it. IN THE END THE MOST IMPORTANT THING ABOUT SUCCESS IS TO KNOW THAT IT IS SELF ORIENTED. People can feel or see that you are successful by the way you walk, talk, carry yourself or because you have a big if it is what you are after. For some to be successful is to have money for some others is to look good or just feel blessed to do what you like. In my case success is to be able to do whatever I like and be surrounded by the people I like. Look around you, you are surrounded by happy, inspiring SUCCESSFUL PEOPLE, I will go further and name a few of them. All of them are inspiring, happy and successful for different reasons. Nevertheless they have something in common, they are passionate and KNOW WHAT THEY WANT! Paul D, Rachel G, Car R, James L, Igor F are SUCCESSFUL PEOPLE IN THEIR OWN TERMS. I look at these guys and they radiate positivity, I love the way they live what they do. They are Real! GUYS THINK ABOUT WHAT YOU LOVE, PLAN AND ACT UPON IT! "Don't downgrade your Dreams Just to fit your Reality. Upgrade Your Conviction To Match Your Destiny!" 2017 is reaching its end and I look back, to be honest I look back at my whole life and try to see to which extent I have applied or am I applying the quote above. I do believe that very few of us have a clear vision, a dream to start with or can actually realize that everything they have done in their lives lead towards the dream that they always had. As Steve Jobs said in a famous speech he gave during a graduation: " you can only connect the dots going backwards". Meaning actions you have done in the past only make sense later in life! Till my late twenties I have been searching for myself and what or who I wanted to be! After few years in Spain I definitely decided that I will be as I used to proclaim back in the day: " HAPPY BECAUSE I WAS BORN TO BE HAPPY". It was a bold statement at the time but it is one of my MOJO! I have always been outspoken, stubborn and with a strong will, the right combo to get what you want. The good thing about life, is that life is a wonderfully TOUGH TEACHER, but if you hang in there YOU GROW, YOU FLOURISH! I am happy looking back, "joining the dots" to realize that everything, any achievements that I can be proud of came through pain and MANY FAILURES. I failed in everything, studies, sports, personal life, work BUT I have NEVER GIVEN UP and eventually I got the reward. I failed in my university years in France (18-21yo) but aged 32yo I turned the table and got an English degree (BA Hons in Business Management) in Spain having to learn Spanish in the process. I stopped football aged 24yo as I was going nowhere and became in 7 months of INTENSE practice Spanish semi professional Thai-Boxing Champion. I met in my life as entertainer many female partners but could never settle. When I expected the least, I met my wife and after 7 years together, 5 married, I am a father of two boys. After years working in the hotel industry during a promotion interview that went the wrong way, my career took a U-turn and I became a fitness professional. I AM LIVING THE DREAM! As I said previously, I WAS BORN TO BE HAPPY JUST BECAUSE I SAID SO AND I BELIEVE IT! 2017 has been a good year, because I am healthy, my family and friends are good. I have few dreams and goals that I am chasing after and right now it is TOUGH as things are not going my way. I am pretty sure that I have FAILED MORE THAN THE MAJORITY OF YOU! The point is that YOU ONLY FAIL BECAUSE YOU TRY. BECAUSE YOU DREAM AND IF I DREAM I NEED TO DREAM BIG! Set big dreams and work your hardest to make things happen, it will surely be tough the bigger the dream the more you suffer, but to MAKE IT HAPPEN IS YOUR DESTINY! "We don't Plan to Fail, We fail to Plan!" This apply to many of us, the vast majority including me. In any aspects of our lives success, achievements is linked to the simple formula: plan, apply, assess and address issues if needs be! Generally, people who plan achieve a lot and on the contrary the people who don't plan achieve way less. GUYS, OUR LACK OF PLANNING, VISION MAKE US FAIL!! I don't mention effort, as from a fitness perspective most of you are working REALLY HARD, but THEY ONLY PUT THE WORK IN HERE ( in the gym not with the nutrition) AND MOST OF THE TIME THEY PUT THE WRONG WORK! In order to make myself understand I will take few real life examples, 3 case study. I will name one person but not the other two. Rachel G is into cycling and ultra distance events on bike or else and most of the time she is on a bike as long as she can. She will have some odd conditioning sessions but MOST OF THE TIME SHE WORKS ON HER BIKE BECAUSE HER SPORT IS CYCLING. Her training focus totally depends on her on her competitions agenda. Fiona is another example, she cycles a lot because it is her passion and she is not bother about physical appearance. Nevertheless 2-3 per week she comes to the gym and does light training sessions. Mainly free weight at such a low intensity that she doesn't break a sweat. Finally Ben trains hard and a lot, he can be in the gym for over 3 hours days and will depending on the day do as much as he feels capable of . An example would be run in the morning followed by weight and in the afternoon, body pump and spin! The case study 1 is the example of what WE HAVE TO DO. Plan, organize, apply and assess the results. I have known Rachel for years now and I remember when she was doing TOO MUCH and got badly INJURED. Now she plans and focus on the important aspect of her training and get the results. Here we have the example of someone who could get better results for the times spent in the gym if she had a clear idea of what she wants to achieve. Right here you have to wonder if your time is precious, if it is you may decide to spend more time doing other things you like than wasting your time in the gym! Ben should get the best results if we just focus on input (time and training intensity ), but Ben is actually getting the least benefits of the 3. You need to know what you want to achieve in order to design your training plan. You cannot train based only on impulse, (I ate too much yesterday so I will train 4 hours today). You train when you are totally exhausted. You try new routines every so often. You chose training partners that don't fit the bill..."If I want to get better on the spin bike, I surround myself with people like Paul, Rachel or Daniel, proper cyclists who are going to push me. On the other hand, to lift more weight I will train with Andy the GM. In other words don't pick someone who is less fit than you and cannot inspire or challenge You! 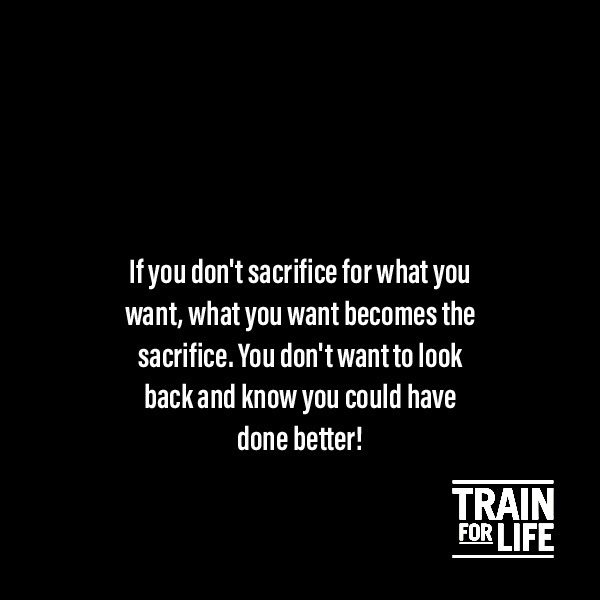 "If you don't sacrifice for what you want, what you want becomes the sacrifice. You don't want to look back and know you could've done better." I normally find examples in my life and I will surely found some but not to be repetitive, I will throw indirects. I want you to read through the lines and identify what you do or don't that in the end make of YOU THE SACRIFICE. The majority of the people train for health reasons, to be fitter, stronger or look better. No matter the reason why we train for, we all reach that point that in order to get results we need TO SACRIFICE. Sacrifice takes different forms, waking up earlier to train or to go to train late after work, not having time to socialize or being on social media in order to exercise. It can also be to actually train harder and spend less time on your phone while training or not taking steroids and putting the work! As you see SACRIFICES TAKE MANY FORMS! Ultimately, We get what we deserve in form of results. If we have put the work, we have been disciplined and have done the right things, We are happy and fulfilled. On the other hand if we have taken short cuts and haven't faced the reality, the day we truly look at ourselves in the mirror WE WILL KNOW THAT WE FAILED OURSELVES. When asked about getting results in fitness and life my answers are and will always be the same. Be disciplined, and put the work, it will obviously be hard but you will get LEGIT results. I Believe it When I see it. NO! I SEE IT WHEN I BELIEVE IT! Everything starts with an affirmation, a desire! I WANT TO BE, we don't wish to BE, WE WANT TO BE. And when you want something REALLY BAD YOU SEE IT, YOU TOUCH IT, YOU LIVE IT. I will name few successful people in their field and some motivational speakers! "How bad do you want it? IF YOU WANT IT AS BAD AS YOU WANT TO BREATHE THEN YOU WILL BE SUCCESSFUL." E, Thomas. The wife of Walt Disney was interviewed after the death of her husband and the reporte told her: "It is a shame your husband could not see in real life his accomplishments." She replied with a smile: " HE SAW IT!" "IF YOU WANT TO SUCCEED...IT HAS TO BECOME AN OBSESSION! C.T Fletcher. Connor McGregor was asked during an interview after winning his first UFC World title if it felt as good as he imagined, and the answer was : " it WAS AS HE PICTURED IT, JUST HOW HE LIVED IT BEFORE! " I believe all these guys because I do exactly the same, I set myself a goal and I put the work. I don't say that things are easy, they are not, I suffer a lot, I got frustrated as things don't always go my way but "HARD WORK, WORKS!". You need to believe, I saw myself winning all these competitions before OFFICIALLY winning them. Life is a competition and as Les Brown said:"Life doesn't give you what you want, it gives you what you DESERVE!" I won, win and will win MORE BECAUSE I DESERVE IT. AND BY THE SAME TOKEN I LOST LAST WEEK IN MY LAST COMPETITION BECAUSE I DESERVED TO "LOSE". Losing is part of the process, losing brings you closer to winning if you understand why you lost. Guys be true to yourself, believe set yourself goals dream about how it feels to achieving them, then WORK HARD AND SMASH THEM! 2010 English Open (after four months of BJJ), European champion (after 6 months) then the Abu Dhabi trial Champion and Bronze in Absolute (all weights). Turned Blue belt after 10 months (normally 2 years or more). 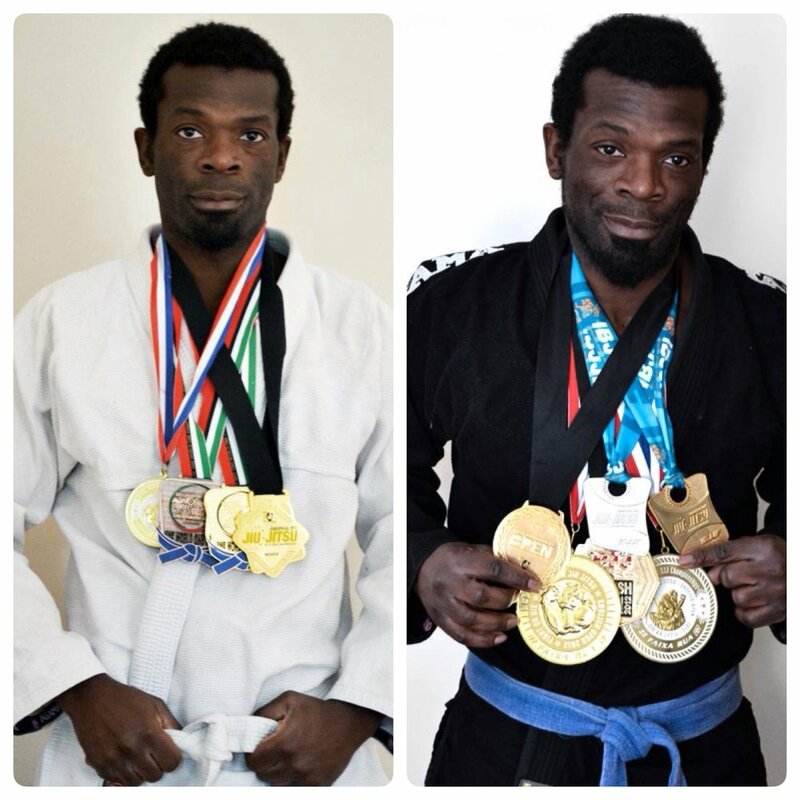 IBJJF London Open, English Open, European Gold & Silver in Absolute, British Open Gold. 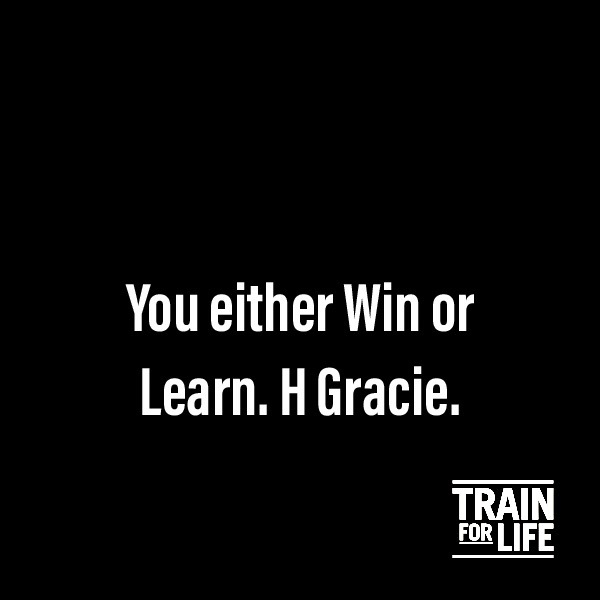 (In BJJ) "Either You Win or You Learn. H Gracie. That famous quote is from one of the founder of Brazilian Jiu Jitsu and it applies to my situation today. I went to compete for the first time in 10 months and unfortunately I lost OR should I say FOTUNATELY. I had to think the whole day to find an answer to that difficult question. I got the answer in a form of a quote from a motivational speaker call B Alsbrook: Champions don't make excuses, THEY MAKE ADJUSTMENTS! I am a champion who is now experiencing one of the biggest challenge he can face, to "officially win in a mediocre wa OR TO TAKE THE RISK TO GROW AND EVENTUALLY LOSE BECAUSE OF THAT. The second option is an official LOSS, BUT IS THE STEPPING STONE OF WHAT I AM ON THE VERGE OF BECOMING. I explain myself, as a White & Blue Belt I won all the major BJJ competitions in England and was twice European Champion. It was good and my skills and mind set at the time led me to achieve these goals. As a Purple and now as a Brown belt, I want MORE! I want to be remembered for my technique my style, my knowledge of the ART, NOT FOR MY PHYSICAL PROWESS or passed achievement at a lower level. So I made a choice, I decided to train to polish my technique and skills and to fight according to my philosophy with no regard to the possible consequences. Today is one of this day that I feel 1/3 UPSET, ANGRY FOR THE LOSS and 2/3 SATISFIED WITH ME. SATISFIED? ?, I am not crazy and haven't smoked either! I am satisfied because I had a game plan and I executed it, last January I took the decision to be PROUD of doing the right thing, no matter the results. I want to be risk taker, NOT THE ONE WHO "just" WINS OR WINS BY LUCK. This is what I did today, I took riskS and it half PAID, On one hand I LOST THE FIGHT, BUT on the other hand I learn very valuable things. In other words I know what I have to work on in the future and I also know that I improved in my defense, which is a MASSIVE point for me as MY OFFENSE IS MY MAIN ASSET. Today is one of this day that you can sit and appreciate all the good things you have, how you impact on people, how you are perceived and what else you have to achieve. Massive thanks to Andy H, Chloe and all the guys who were at Andy birthday meal for the support. Charlie, Grace, Tom and my coach Steve...and the others. Massive thanks to Chris P MY TRAINING PARTNER and congrats for the progress you are making. BIG, BIG THANKS to Michael F, you are a man of your word, thanks to drive to London with me and support me. In challenging times you get to know people, you are definitely someone to keep close. OF COURSE BIGGEST THANKS TO MY WIFE SUSANNAH AND MY BOYS MILO AND NOAH. EVERYTHING I DO IS FOR US. LEADING BY EXAMPLE IS THE ONLY WAY TO LEAD AND I UNDERSTAND THAT I NEED YOU TO BE A BETTER, FIGHTER, HUSBAND AND FATHER! "Make of yourself a priority, it is not selfish, it is necessary"
As of now, on a weekly basis I will interpret the meaning of "the quote of the Week". In other words I will share with you what I did in order to apply the valuable piece of advice. I am as you know into fitness, my family, friends and my religion. On a daily basis I talk about these important factors of my life, I wake up I pray, go to the gym train, get back home look after my kids, return to the gym train a bit more, get back home to my wife and sons and so on...THE PERFECT LIFE! NOW IT IS THE PERFECT LIFE BUT TWO YEARS AGO IT WASNT. I WAS NOT HAPPY, I WAS UNFULFILLED! 2 years ago I used to get up around 6am and go to the gym and WORK, (run a class or train my clients), then go home to fulfill my duties of father, then back to the gym, then home and TO BED. I felt that I was ONLY WORKING and doing things by obligation. My problem was that I simply FORGOT ABOUT MYSELF! I simply started to remove the unnecessary and replaced them by things that make me feel good. The massive change is that I am up at 4, 4.30am, I go to the gym sit down to listen to the Coran or some motivational speeches. I spend time with myself. THE MOST IMPORTANT, IS THAT MY FIRST 20 minutes of reception of information from the outside ARE POSITIVE. IN OTHER WORDS, I START THE DAY LISTENING TO POSITIVE THINGS "NOT" DEPRESSING TV News. After spending time with myself, I do what I LIKE MOST, I TRAIN! Starting that way mkes the rest of day SO MUCH BETTER. The rest of the day does not vary much, it is JUST that I am POSITIVE AND CAN GIVE THE BEST TO MY WIFE AND KIDS. The other big change comes at night, I spend less time on YouTube watching worthless contents and more time reading or watching fitness and BJJ instructional. I also added a stretching routine before bed time. I made few changes in my life, I removed the unnecessary and added more structure to my routines and I feel Myself again. I am feeling GREAT. SOMETIMES, MORE DISCIPLINE, A DEEP REFLEXION ON WHERE WE ARE AND WHERE WE WANT TO BE CAN CHANGE THE GAME. I often refer to myself as a happy and contempt person, as I realized that to be unhappy and moaning all the time does not change anything! My physical state could be summed up like, what does not ache today? Nevertheless, this reminds me a post I saw years back on Social Media from the brand "Old ManStrenght". It was a picture of an Old Man in his 50/60s, the man looked, Young, in shape and fearless and with scars on his face. The post stated, " I Am Old For A Reason"!. The translation of the quote could be, "I made it this far because, I am Strong, a fighter a True Warrior! Returning to my Physical state, I feel like that Old Man, no matter what aches in my body, I find a way to Train. I love lifting weight, doing Kettlebell and Exercising in general. Truth being told, I LOVE EXERCISING, SO NO MATTER WHAT I DO, AS LONG AS I EXERCISE, I DO MYSELF GOOD...I KEEP ON FIGHTING, I GROW STRONGER AND LIVE THROUGH THE PRINCIPLES I BELIEVE IN. This is hard to admit but it is true! I can't do today what I used to do consistently 3 years ago when I was 40. Should I cry about it or move forward and make the best of it. I decided to move forward! Years back, I used to train 3-4 times/day at a very high intensity. Last week Thursday I had my first SERIOUS CONDITIONING SESSION in MONTHS, 5 days later I AM STILL FEELING IT! Now I Have ONE AWESOME DAY IN TERMS OF FITNESS AND MANY (many) REGULAR ONES. I believe in Being proactive and makes things work, so I look for the bright side and enjoy the fact that I can STILL EXERCISE! I believe wisdom encompasses everything else, to make a point, I will take an everyday life example that has a repercussion on my fitness level. A month a go, my sons left the lights of the car on (I didn't realize) and I found myself with a flat battery. I was obviously not happy, I get my neighbor to jump start the car to be able to get to the gym. The same day I ordered some jump start cables. Where did the Wisdom kick in? Every time something "Negative" Happened, I was "proactive" and a final bill of £240 IS NOTHING IN COMPARISON TO BE STUCK IN FRANCE WITH THE WHOLE FAMILY IN THE CAR AND HAVING TO ARRANGE ALL SORTS TO GET BACK TO NORWICH. This Last episode convinced me to use my road bike 5 times a week to commute from the gym to my place and even to walk once a week. I do it for several reasons, one is I want to BE ACTIVE, if I can't Run, I will WALK. If I can't train 2-3 times a day I want to be on my Bike, I want TO BE ACTIVE! I do it for my conscience, as a personal trainer, as someone who want to contribute to our kids future in terms of pollution. Driving twice less is SOMETHING I CAN DO, IT MAKES ME FEEL GOOD AND SAVE ME MONEY! "Live The Dream (Your Life), Don't Dream Your Life..."
5 years separate the 2 pics, in 2011 as a Fresh White Belt I became BJJ European Champ and 5 years later as brown Belt, The Old Man with a dodgy Back won Bronze...the only difference between pics is my Age. The PASSION AND DESIRE ARE INTACT! Thanks to God, I am a blessed man, I have anything I need I life, I am healthy, I have a great family and friends and I love what I do. The issue with loving your job is that you don't seem to be working, so you keep on going, on and on. Yep I enjoy being at 24/7 Gym in Norwich so much that I hadn't have a real break since Xmas! You know what, my body and mind were screaming for a holiday, so I was really happy to have one. Holiday and Fitness, how to maximise your Holiday? I normally go on Holiday to visit my Family or closed friends, I also revisit my relationship with my own little family (my wife and my boys). On holiday I like yo strengthen my bonds with my brothers and sisters, to catch up and spend quality time with them. I am really pleased to see how my boys are getting closer to my family and how much they enjoyed being in France. A holiday break also alows me to catch up with my own family, to be there in the morning and have breakfast, lunch, dinner with my wife and kids. These simple things rarely happen when I am in Norwich because of my work and personal commitments, so it is good to enjoy the "Noisy" family full on. My habits change on holiday and it is good for few days, as it makes me think about what I normally do. We are animals of routine, so to do things differently for a short period of time make us appreciate if we need changes of not! Strengthen Or create these bonds with your love ones. Question your habits, assess them and eventually create new ones. The food part is the best of Holiday! My mother food is simply the BEST, there is nothing like the food of your childhood. On top of that I don't eat African food at all while in the UK so to eat mum's food is just TOO MUCH. I finished Ramadan a week before my holiday, I was at my leanest in 5 years and I knew that I was going to my mother...I knew my waist line was going to take a blow! AND IT DID...my 6 packs turned into a 2Pac! Nevertheless, the best thing you can do on holiday is to EAT! don't count calories enjoy yourself and eat, try stuffs. On a physical, physiological level, we cannot be at our leanest the whole year long! To slip off the road isn't bad. REMEMBER, WHAT WE ARE or THE WAY WE LOOK DEPENDS ON WHAT WE CONSTANTLY DO, NOT WHAT WE DO FOR A WEEK OR TWO! From a fitness perspective, as mentioned above we need BREAKS, we sometimes feel sluggish, tired, over trained when we workout. We rarely feel heavy and UNFIT! This is a weird "disgusting" feeling, so not cool that if we feel that way, we actually experience a boost of energy that allows us to train really hard to get back to where we belong. Finally from a mental point of view, it is necessary to LET GO. I drank orange juice, Ice tea and COCA COLA...and I FEEL AWESOME. I don't normally drink sweet or fizzy drinks at all but on holiday I say to myself, WHY NOT! I don't normally have breakfast, so to have something to eat was already a big step. Nevertheless, you can eat but still make the right choices! Dont count calories on holiday, eat what you like till you are not hungry anymore. Eat and drink your "forbidden" , it may be pancake with Nutella for you, a COCA COLA FOR ME. Whatever it is! Just Enjoy the food while hungry, While hungry... When full, stop! Tomorrow is another day. It is the main reason why we go on holiday...to rest. The question is do we rest on holiday? With a almost 5yo and 3yo boys, resting is an issue. We were tired on holiday and now we are recovering from the holiday. At home, my wife and myself share our time with the boys, in other words, we are with them 4-6 hours then we don't see them for the same amount of time. We manage to rest, I can sleep 6-8 hours during most nights on holiday for 4-6 hours in Norwich. I normall don't train at all on holiday and even moan when we go to the zoo or the park or the shop...I am just at my LAZIEST! I avoid fbk, Instagram...anything related to work, I stwitch off my brain and just enjoy thinking about the next meal, cartoon or meeting with my brothers...simple stuffs really. "RICH IS NOT ABOUT HOW MUCH YOU HAVE...BUT HOW LITTLE YOU NEED"
Sleeping is a luxury when I am working, it is a DUTY when I am away. The focus is on the families, to spend time with my closest ones, no time on social media or work related communications. Just Relax! Finally, the law of the MINIMUM EFFORT IS RESPECTED TO ITS FULLEST. I just move the strict MINIMUM. I tried to share with you my holiday, but I mainly tried to highlight why to live your Holiday its fullest is important. We are as I previously said "Animals of Routine", and the holidays get us out of that routine. A routine can be good or bad, it depends. If bad, a holiday can help perceive that we need some changes. If good, a holiday acts as a RESET button. As an example we train our hardest to look good to go on holiday, we are motivated but also tired of everything in general. Once on holiday, we leave everything behind and enjoy. When we are back, we are RESETED AND READY TO GO. IN ALL HONESTY, I NEEDED AND DESERVED A BREAK. NEVERTHELESS, I AM SO HAPPY TO BE BACK AND DO WHAT I LIKE, SURROUNDED BY THE PEOPLE I ENJOY BEING WITH...TILL MY NEXT HOLIDAY! On Friday the 23rd of June at around 5.45pm, I was on the top floor of 24/7 gym with my two clients Simona and Joseph having a PT session. Suddenly from the corner of my eyes, I saw Curtis PT Fulcher having a photo shooting "bare chested" on the gym floor. I went to see his friend, the one who was taking the picture and told him: "If you want to take pics, why don't you go into the spin studio, as it is empty". I was ANNOYED, HUNGRY, TIRED WITH VERY LITTLE PATIENCE...RECIPE FOR DISASTER, so I went downstairs at the reception to speak with the member of staff on shift. Chloe was on shift, I pointed Curtis on one the CCTV camera and Chloe and I both went back upstairs. At that point Curtis was on a XTrainer, so I left Chloe to it and returned to my PT session. I WAS NOT THERE, SO I DONT KNOW WHAT EXACTLY HAPPENED. Monday 26th am, I saw Andy briefly and he mentioned the story with Chloe and that most likely Curtis PT Fulcher would be banned. Monday evening, Andy Hunter the 24/7 GM was called at the desk by Curtis who asked to have a word with him. Andy invited him in the back office and both men had a conversation which turned into a HEATED CONVERSATION. If you haven't yet read Curtis PT Fulcher Facebook status, please do as it will help you understand better. Curtis PT Fulcher is a Personal Trainer, so well aware of commercial gyms etiquette, standards. In my years as personal trainer and my experience as a gym user in France, Spain, Belgium or England it is unheard of a gym member taking pictures "BARECHESTED" on the gym floor in rush hour. Unless, the management of the gym is aware of it and happy with it? 1- I told his friend to tell him to use the Spin studio for his pics. 3- Andy made the professional mistake to voice out loud that he may ban Curtis from the gym. 4- Curtis went to the back office WELL PREPARED, HE lured Andy in his trap and posted everything PROUDLY on his Facebook page. 5- As you can read on his Facebook page, he threatened Andy H several time that he will make him lose his job, if he doesn't receive a gym year free membership. 6- Check the attached picture, it is private message Curtis PT FULCHER sent to Aaron, ordering him to delete his status or Andy H would pay for it. 1- Andy didn't act professionally by talking in the wrong place of what may happen with Curtis. 2- On Monday, Andy avoided Curtis the whole evening...WHY?? IT TURNS OUT THAT ANDY HAS RECEIVED TWO PHONE CALLS ON MONDAY MORNING, TWO BAD AND REALLY HARD TO STOMACH PHONE CALLS. BOTH OF HIS PARENTS ARE "SERIOUSLY" ILL, I CANNOT GET INTO DETAILS AS YOU WILL UNDERSTAND. After receiving these phone calls Andy was not in the mood to deal with anything or anyone. UNFORTUNATELY HE HAD TO FACE CURTIS AND WE ALL KNOW THAT IT WENT WRONG. 1- What is to be professional? To be barechested on a crowded gym floor? 2- To ask a member of staff where it is written that "We are supposed to wear clothes when on the gym floor"
3- Arent you personal trainer? 4- You were given possibilities to stop the situation going out of control, instead you preferred to make THINGS WORSE. THE MAIN DIFFERENCE BETWEEN ANDY AN YOU IS THAT ANDY IS A GOOD PERSON WHO HAD A VERY BAD DAY. THIS LED HIM TO BE UNPROFESSIONAL, I REPEAT, HIS PERSONAL CIRCUMSTANCES LED HIM TO BE UNPROFESIONAL. IT IS REALLY SAD TO WISH TO SOMEONE TO LOSE HIS JOB, IT IS REALLY SAD TO BLACKMAIL SOMEONE AND TO THREATEN OTHERS AND ASK FOR YEAR GYM MEMBERSHIP IN EXCHANGE OF YOUR SILENCE. I don't know what is on that video you recorded but I will and most people will know soon. As you set him up, it is hard to have any kind of sympathy for you. REMEMBER, GOOD PEOPLE MAKE MISTAKES. Andy is my friend BUT HE IS ALSO AN EXCELENT GM, nevertheless I ADMIT THAT HE MADE A PROFESSIONAL MISTAKE. CURTIS YOU MADE A LOT OF MISTAKES A LOT, YOU SHOWED YOUR TRUE COLORS. I THINK THAT WITH WHAT HAPPEND TODAY YOU DID YOURSELF A MASSIVE DISSERVICE. THE FITNESS INDUSTRY IS BIG BUT NORWICH IS SMALL, SO YOU CANNOT AFFORD A BAD REPUTATION!! Today I was with my two sons in the park, they were having fun and I was enjoying every bits of the moment. I said to myself, THIS IS PERFECT...at that point, I remembered that Carly and Leon got married last week, that Flori came back from Manchester safe and sound, that I am enjoying Ramadan, my Muslim community, the guys I work with in the gym, my clients, the gym members who take part to my classes and those I see on a daily basis, my friend, my family. At the same time that we grieve and are angry many good things happen around us! To Smile because we can, to train harder because we can, to support each other and bring some good vibes wherever we go. I like to say and I mean it, that I feel blessed as I have everything I need to be happy, I am healthy, so are my closed friends and relatives, I do the job I love and I surrendered myself with amazing people. TO BE HAPPY OR NO IS A CHOICE I MAKE! DESPITE ALL THE BAD THINGS GOING ON AROUND US, ALL THESE THINGS WE CANNOT CHANGE. I was up at 4.05am, kissed my wife and my sons (the boys were asleep). After the last preps, a morning prayer, I was out the door walking to the bus station. It was freezing, I finally got there after 20 minutes of a chilly walk. I buried myself in the last seats of the coach, read for a hour and then returned to dreamland till my arrival at Stansted. The plane is late and I am stuck in a SMALL SEAT where I can hardly move.. I am uncomfortable on my seat, nevertheless I managed to read and back to dreamland. The flight is cool not too bumpy and the view is astonishing. I finally land at Lisbon airport, I wait for my brother who is flying from France. 10-15 minutes later, he is in front of me. We get on a cab direction to the hotel. MY BACK IS RUINED...3 hours in a coach plus another 3 on the plane...A PROPER TORTURE! After checking in, I FaceTime my wife, they were having lunch, the boys are NOISY AS ALWAYS, but their voices sound to me like sweet whispers. THEY FINALLY SAY "DADDY WE MISS AND LOVE YOU". With my brother we spend the rest of the day going to the competition venue to check on Fordy, one of my training partner who was fighting. After that we are back to the hotel then out for dinner at "Bom Jardim", a Portuguese restaurant famous for its chicken. In regard to food, I have been restricted as I have to make the weight. I AM STILL ON DIET! As the day went by, my back relaxed and felt REALLY GOOD AT TIMES. The Twist is that I am coming up with some COLD... My throat is a bit sore, nose itchy... The high temperature hasn't settled yet! WHEN I GET UP IT WILL BE COMPETITION DAY! 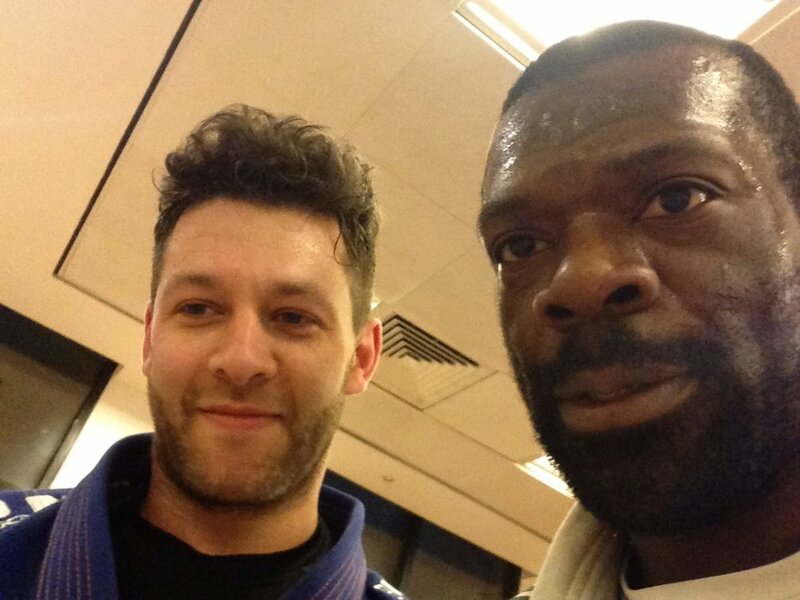 Christopher, a fellow teammate who competed at the BJJ Euro for the First time. It is this time of the year where I remember all these important people in my life. For the second year in a row, I am off to Lisbon for the BJJ European Championship, which is officially the biggest BJJ competition in the world. Last year was stressful, I went there as a fresh Brown Belt with more doubts than certainties. This year is an awkward one, on one hand I feel very confident with my technique and skills. On the other hand my lower back has and is still a source of concern. Let me get you through the training camp and my sensations prior to the competition. From the 21st of November to the 21st of December, I launched the Train For Life Pre XMas Challenge...the best idea Ever! Having to pay attention to what I eat made the Xmas break at my boys' grandparents really easy. I didn't binge on food, I ate well but never felt blotted, as a result I came back 1-1.5kg heavier compared to the 3-4kg I put on last year. 3-4 days after my return to Norwich, I was back to my weight which is 1.5-2kg over my competition weight. In other words I had 2 weeks and a half to lose 2kg, which was great news. The diet looked after, my only focus was on training BJJ and the strength and conditioning. A good story always comes with twists...here they are!! My BJJ and conditioning preparation were both altered due to singular and persistent lower back problem. In regard to BJJ, it limited me so much that I could not turn on my right side or move explosively. In regard to lifting weight, I found myself squatting and deadlifting 20-30kg less than what I was used to due to the discomfort and pain. Honestly, at that stage I was just saying to myself. "Daddy you go out there as planned and you do what you can". I HAVE NO EXCUSES, JUST HAVE TO GO THERE, MAN UP AND MAKE IT HAPPEN! Twists!! As I mentioned it earlier a good story comes with twists... I kept on sleeping, eating well, praying and training. On Wednesday 11th, I decided to see Josh Crosley a sport massage therapist that I HIGHLY RECOMMEND. I had a first massage which was painful, but freed me a bit. This aloud me to get back to my training regimen, without a rest day for 10 days. He took it on board and got to work... The massage was not as painful as the first BUT THE RESULTS WERE AMAZING. The same night, I went at the academy to spar and found myself moving almost as if I was not injured at all. To double check, I returned to the academy on Tuesday morning to spar with Russell and Simon two teammates purple belt . The result was the same I felt great. I recovered 30-40% mobility and consequently my confidence experienced a boost. I no longer go to compete and do my best, I go to compete to claim the position of the BEST. Wednesday 18th was "The Test", this morning, I had my last sparing session, the hardest of all with Luke my training partner. To spar with Luke is hard for various reasons. He is really good and on top of that he knows me really well as we train a lot together. The session was really tough and I pushed as hard as I do when I compete. I needed to see what my back could take. I felt stiff sometimes and my lower back locked itself afterwards, but the general sensations are positive. I felt sharp. The same evening, I had my last massage with Josh at 7.45pm, it ached as always but felt looser and definitely more relaxed. "Big" Russell and Simon. Massive thanks to the boys who came especially to spar with me as preparation for the competition. I am so grateful.